By playing out cards, players erect governing houses and send emissaries to the regional courts. They obtain victory points for skillful house place- ment as well as successful alliances between their emissaries. The constant battles are all about one thing: becoming the new Emperor. 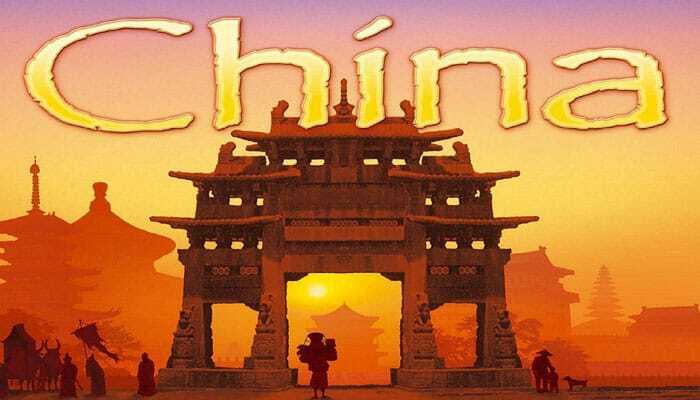 It depicts a map of China around 200 B.C. 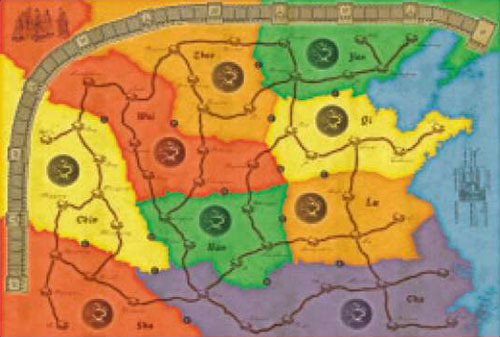 Of the 9 regions on the map, 8 consist of four pairs of regions sharing the same background colors (e.g. Zhao and Lu). Purple appears only once on the board, in the ninth region (Chu). Houses and fortifications will be placed onto the house spaces over the course of the game. House spaces are connected by roads that are of importance during final scoring. Emissaries will be placed onto each region's dragon space over the course of the game. The numbers from 1 to 15 indicate possible alliances between the emissaries in two regions. 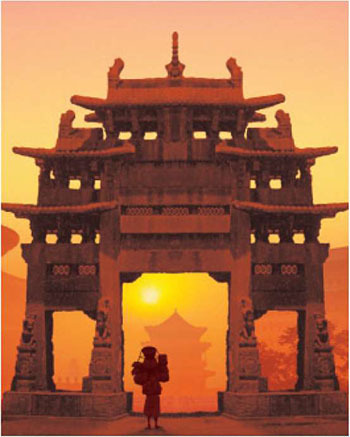 The scoring track has the form of the legendary Great Wall of China. Should a player's score ever exceed 50, he moves his scoring marker back to 0 and continues scoring as usual. He also receives a point card that he lays out in front of himself. Should a player's score ever exceed 100, he receives a second point card. The game board is double-sided, with different layouts on both sides. Depending on the number of players, the appropriate side is chosen. With 4 players, either side of the board may be selected. Each player takes all houses and emissaries in one color. Each player then places 1 of their emissaries onto the 0 space on the scoring track to act as a scoring stone. When playing with experienced players, each player also takes 1 fortification; otherwise they are not used. 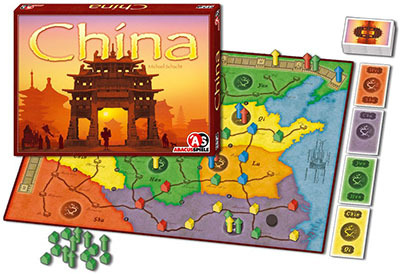 With 4 players: 1 region card in each color is removed from the game and returned to the box. With 3 players: 2 region cards in each color are removed from the game and returned to the box. The remaining region cards are shuffled. Each player is dealt a hand of 3 face-down cards. The remaining cards are placed as a face-down draw pile near the board. The top 4 cards in the draw pile are revealed and placed face-up next to the draw pile. The point cards and scoring markers are placed nearby. The players agree on a start player. That player receives the Emperor marker and places it in front of himself. He will keep the marker throughout the game. The start player starts the game. Play continues in clockwise order. The player may choose to exchange 1 card instead. Play continues until the draw pile has been exhausted twice, after which the final scoring, in which the houses, emissaries and roads are scored, takes place. The color of a region into which playing pieces may be placed, is indicated by the color of the region card(s) played. This will often include a choice between two regions of the same color. A player may only place pieces in a single region on his turn. A player may place only 1 piece in a region that doesn't have any pieces yet. A player may place up to 2 pieces in a region that has at least one piece of any color. A player may place only 1 piece per region card. Two region cards of the same color may be played as a 'joker' to place 1 piece into any region of another color. The 3-2-1 Rule is a useful reminder: A player may use up to 3 cards to place up to 2 pieces into 1 region. Once played, cards are added to a face-up discard pile next to the game board. If a player doesn't have any pieces of a certain type left, then he may no longer place pieces of that type into a region. A house must always be placed onto a house space. A house space may not contain more than 1 house. Should all house spaces in a region be filled, then no more houses may be placed in that region. An emissary must always be placed onto a dragon space. A dragon space may contain multiple emissaries. Fundamental rule: The house majority within a region determines the maximum number of emissaries that may be present in that region. For example, suppose that Zhao contains 3 red and 2 yellow houses. The maximum number of emissaries that may be on Zhao's dragon space is 3. Important: A player may place emissaries into a region even if he himself hasn't placed any houses into the region. No emissaries may be placed into a region without any houses - no majority exists in that region yet. Once all house spaces in a region are filled, the current player's turn is briefly interrupted for house scoring in that region. Example 1: Alex has 1 purple and2 red cards in his hand. He chooses the red region Wei and plays out 1 red card. Since no pieces have been placed in Wei yet, Alex may only place 1 piece. His turn is over after placing the piece, since he may only play into one region per turn. Barbara plays out 1 red and 2 green cards. She also chooses Wei, but may place 2 pieces there because of the piece Alex placed earlier. She uses her red card to place her first piece, and the pair of green cards as a 'joker' to place her second piece. Chris has 3 yellow cards in his hand. 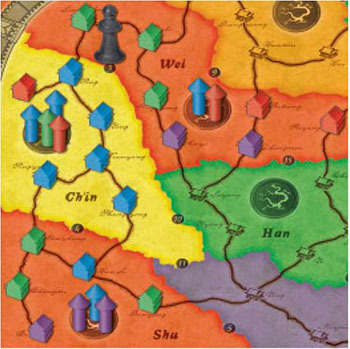 There are already some playing pieces in both of the yellow regions, Qi and Ch'in. Since Chris cannot place more than 2 pieces on any turn, he can choose to use 2 yellow cards either to place 2 pieces into either Qi or Ch'in or as a 'joker' to place 1 piece into a region of a different color. Example 2: Alex would like to place emissaries into the purple region Chu. Barbara currently has the most houses in Chu. She currently has 4 houses in the region, meaning that no more than 4 emissaries may currently be placed onto Chu's dragon space. Since there are currently only 2 emissa- ries in Chu, Alex may add two more. To do this, he plays out 1 purple card and 2 orange cards as a 'joker'. Example 3: Currently, both Barbara and Doris have 2 houses in the yellow region Qi. They are tied for the most. Since no emissaries have been placed into Qi yet, up to 2 emissaries could be placed into the region. Note that the cards required to place 2 emissaries in this example could also be used to place 2 houses or 1 house and 1 emissary. The player with the most houses in a region receives one point for each house in the region, regardless of color. The player with the second-most houses in a region receives one point for each house belonging to the player with the most houses. The player with the third-most houses in a region receives one point for each house belonging to the player with the second-most houses. The player with the fourth-most houses in a region receives one point for each house belonging to the player with the third-most houses. 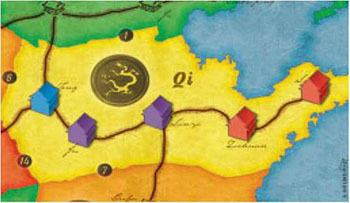 The player with the fifth-most houses in a region receives one point for each house belonging to the player with the fourth-most houses. If a player doesn't have any houses in a region, then he doesn't score any points for that region. In the event of a tie, the tied players receive an equal number of points. All other players receive points for their position without skipping any for the tie. The players move their scoring stones along the scoring track a number of spaces equal to the number of points they just received. After the houses in a region have been scored, a scoring marker is placed onto that region. Important: Even if the houses in a region have already been scored, players may continue to place emissaries into that region, provided they follow the placement rules. Example 4: Alex (green) has 4 houses, Barbara (red) has 2 houses and Doris (blue) has 1 house in Wei. Alex has the most houses and receives 7 points (4+2+1). Barbara has the second-most houses and receives one point for each house that Alex, the first-place player, owns (=4). Doris has the third-most houses and receives one point for each house that Barbara, the second-place player, owns (=2). Example 5: Barbara (red) and Chris (purple) each have 2 houses in Qi. Doris (blue) has 1 house in the region. Barbara and Chris tie for first place in the region and each receive 5 points (2+2+1). In this case, Doris has the second-most houses and receives one point for each house that a first-place player owns (=2). A player only replenishes his hand back up to 3 cards once he has finished his turn. He may choose face-up cards or cards from the draw pile in any order and combination he wishes. The face-up cards are only replenished back up to 4 once a player has completed refilling his hand. Replenishing these cards signals the end of a player's turn and play passes to the next player on the left. If the draw pile is exhausted for the first time, then the discard pile is shuffled and used as a new draw pile. If any cards are left face-up on the table when the draw pile is exhausted, then they remain on the table and are not shuffled back into the new draw pile. If the player whose turn it is hasn't drawn back up to 3 cards yet, then he does so now, after which the face-up cards are replenished back up to 4. If the draw pile is exhausted for the second time, then the game ends. The player discards one card from his hand and draws a new card - either one of the four face-up cards or the top card from the draw pile. If the player chose a face-up card, it is replenished from the draw pile. That ends the player's turn and play passes to the next player on the left. The game ends when the draw pile has been exhausted for the second time. The current round is still played to the end. The round ends with the turn of the player to the right of the start player. The game also ends when no pieces can be played any more. During the final scoring, points are awarded for any houses not yet scored, along with emissaries and roads. Houses in regions that don't have a scoring marker yet are scored. The scoring is performed in the same manner as described above. Here, the emissaries themselves aren't scored; rather, the alliances between emissaries in two neighbouring regions are. There are 15 possible alliances, numbered on the board from 1 to 15. The alliances are scored in numerical order. To avoid mistakes when scoring, the Emperor marker should be placed onto each alliance in turn, whereupon the alliance is scored as described below. The Emperor marker is then moved to the next number. An alliance is only worth points when a player has an emissary majority in both of the affected regions. In the event of a tie, the tied players are all considered to have a majority. If a player has an emissary majority in a region, then he might be able to score multiple alliances, provided that he has the necessary emissaries in the neighbouring regions as well. The player with the emissary majority in both affected regions receives 1 point for each emissary in both of the regions, regardless of color. If multiple players fulfill this requirement, then they all receive the full number of points. Any other players receive nothing. 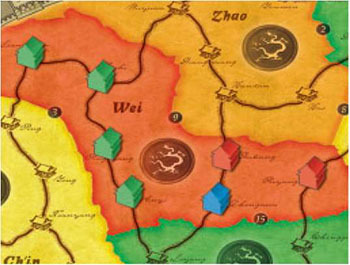 Example 6: The Emperor marker is placed onto the number 3 and the alliance between Wei and Ch'in is scored. There are 2 emissaries in Wei -1 blue and 1 red. There are 4 emissaries in Ch'in - 2 blue, 1 red and 1 green. Doris (blue) has a majority in both Wei and Ch'in and receives 6 points (4+2). The other players receive nothing. Afterwards, the Emperor marker is moved to the number 4 and the alliance between Ch'in and Shu is scored. There are 3 emissaries in Shu - 2 purple and 1 blue. Since neither Doris (blue) nor Chris (purple) have majorities in both Ch'in and Shu, no alliance is made and no players receive any points. Players must have at least 4 houses in an uninterrupted row along a street to score any points. Branches are not counted. A row of houses may extend across multiple regions. A player receives 1 point for each house in the row. Each house may only be counted once. Example 7: In the figure for the previous example, Doris (blue) had 5 houses in an uninterrupted row through Ch'in and Shu. The house in the lower left-hand corner of Ch'in is a branch from the main row and therefore isn't counted. Doris receives 5 points for the row. In the event of a tie, the winner is the tied player with the most pieces (houses, emissaries and fortification) remaining in his supply. A fortification is always placed onto an empty house space. In order to place a fortification, a player must play out either a card in the region's color or a pair of cards in another color as a 'joker'. Important: Fortifications are neutral. Therefore, a player should always play a house onto the fortification on the same turn. If he is unable to do this, then a subsequent player could place his house onto the fortification instead. During House Scoring, A Player Receives Double Points For A Region In Which He Has A House With Fortification. *During Road Scoring, A Player Receives Double Points For A Row Of Houses That Contains A House With Fortification.